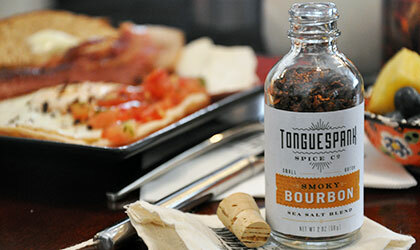 TongueSpank: Liquor-infused spices. For the brave. Limp and flavorless is no way to go through life, my dude. Here to save your taste buds from the boring: Chi-based TongueSpank’s boozy, sinus-clearing table spices, available now. Hot on the heels of a successful Kickstarter, TongueSpank crafts flavor-trippy seasonings by soaking pepper and herb blends with small-batch spirits. The result: a dry hot sauce with the pungent aroma of liquor, sans the alcohol. The Smoky Bourbon, made with Koval bourbon. Great on eggs. The Citrus Rum, for when you want to get tropical. And the Scorpion Bourbon, made with Trinidad Moruga Scorpions — one of the hottest pepps in the world (two million Scovilles!). TongueSpank is shipping now. If you’re curious, they’re offering a 4-pack sampler. Or for those who can handle the heat, there’s the Complete Collection.